Well, the calendar flipped through another year and I have my one extravagance, ridiculously expensive champagne, ready to go. Not sure I'm going to drink it tonight though, since I'm planning to stay home alone. But I do surely love starting the year with bubbles. 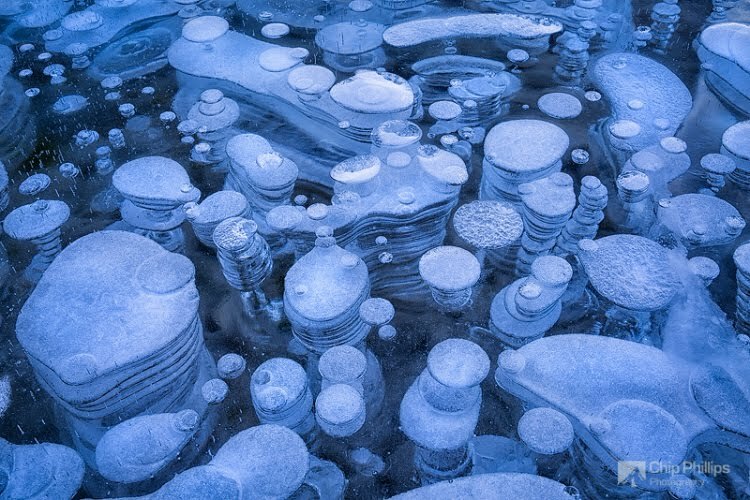 I've seen ice bubbles like this before, but never quite so many or so artfully arranged, not to mention the color of the ice here at this place called Abraham Lake. 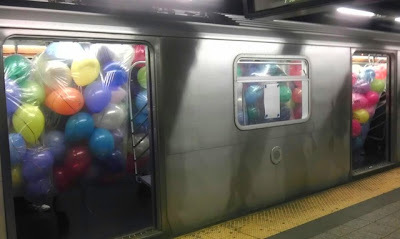 And it's not a party without balloons, so here's an entire subway car full. Far as I know this is a real thing that happened in NYC. 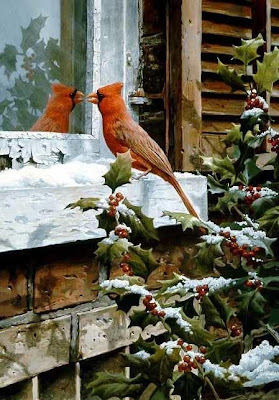 Happy New Year's Eve and if you're going out, be careful. Lot of amateurs on the road tonight. Seeing yet another big snowfall hit the northeast. So more snowmen, or rather snow dogs. 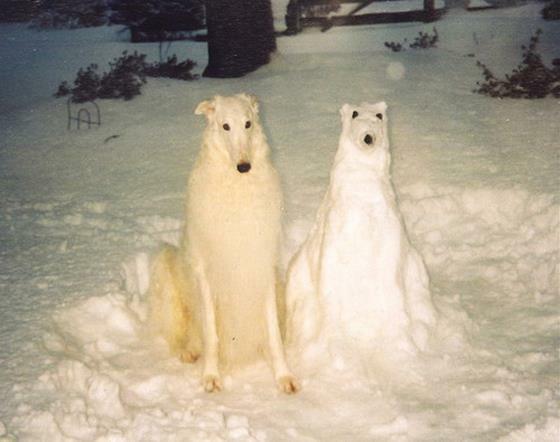 Always loved making snow animals myself. 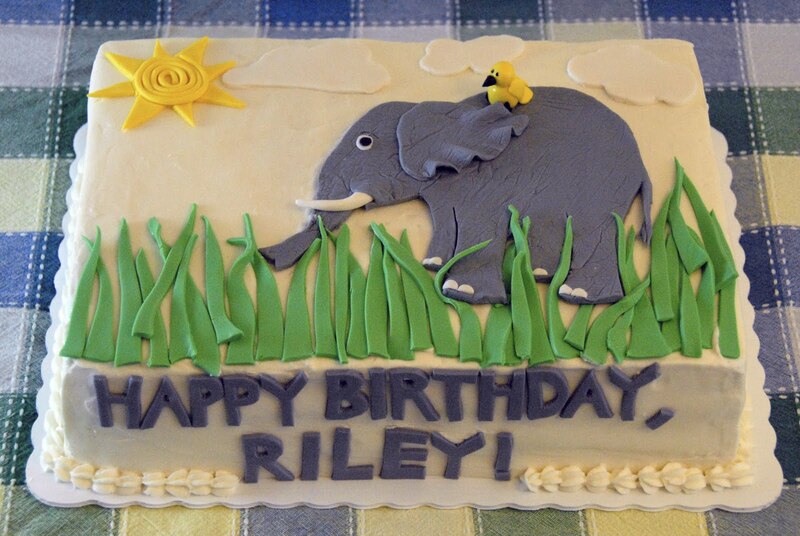 Wish I still had the photo of the huge snow elephant I made one year, but this is very good. Related, but can't be embedded is this page of GIFs of Dogs who love the snow. Usually hate these GIFs but these are really great. Love the first pup who steals the sled and goes for a ride. And unrelated but really cool, is this snow painting on the sidewalk. Have a feeling it's old and I've seen it before, maybe last year, but still brilliant use of natural art supplies. 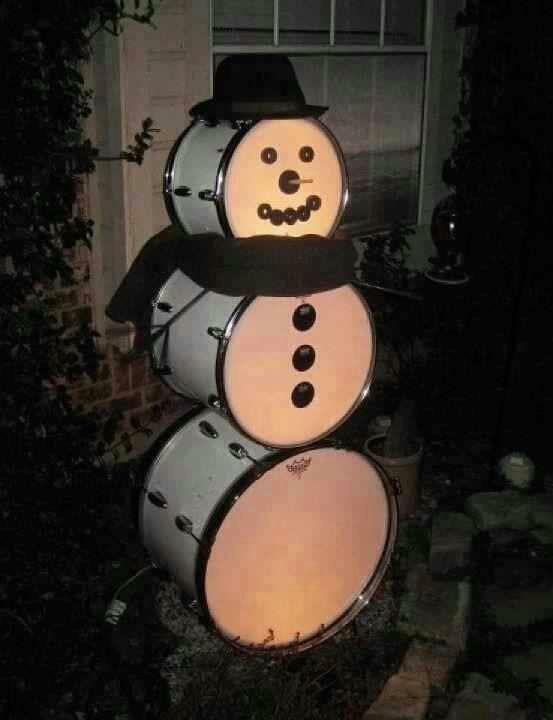 To the creatively themed. 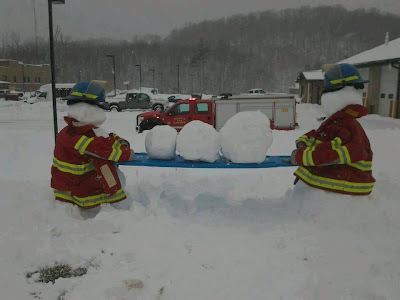 Had to look twice at this one in the thumbnail before I realized the EMTs were snowmen too. Of course there's none of that white stuff here in my little city in the south. But I guess I'm happy enough to trade off warm feet for equally creative substitutes. This was voted favorite something at Yahoo. It's the same technique they use for those really cool sidewalk drawings. Pretty amazing. Love looking at it on the internets. Just as happy not to be walking in it in real life these days. But I remember when it looked like this outside my door in winter. I've never really believed that no two snowflakes are alike, but every single one is a beautiful work of art. Also, National Geographic has a whole archive of historic photos from 1923. 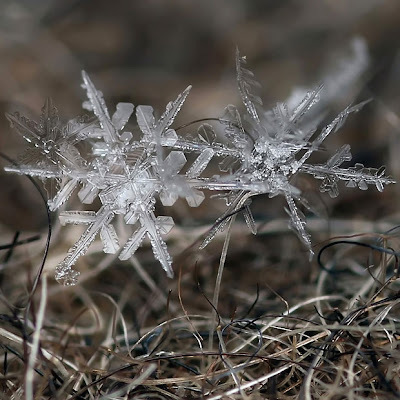 Think this guy was the first one to ever photograph them singly. You have to wonder why they sell so many of them. If you take this in the kindest way possible, it is funny. Made me laugh anyway. It's a little late to post this Christmas carol, but it's done by my internet friend, Mike Finnigan who just finished up a tour with Bonnie Raitt. He posted his rendition of a classic Christmas carol that he did for the TV show ER in the 90s. Which happened to be one of my favorite shows back then. I probably heard it live. 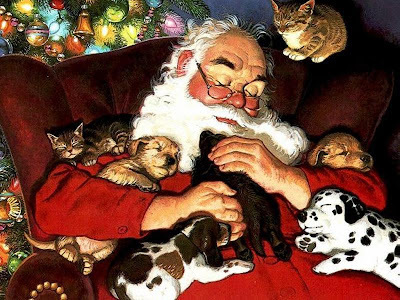 Hope your holiday is filled with peace and joy and Santa brought you exactly what you wanted. Whether you celebrate or not, hope this evening finds you warm of body, peaceful of mind and otherwise enjoying the lovely accoutrements of the holiday. Great idea for a library Christmas tree, or any bibliophile who hasn't replaced their collection of handheld books with a Kindle. If you've ever made a paper snowflake and liked it, you might love this tutorial as much as I did. How the world changes. There was a time when this was considered a very thoughtful and entirely appropriate gift. 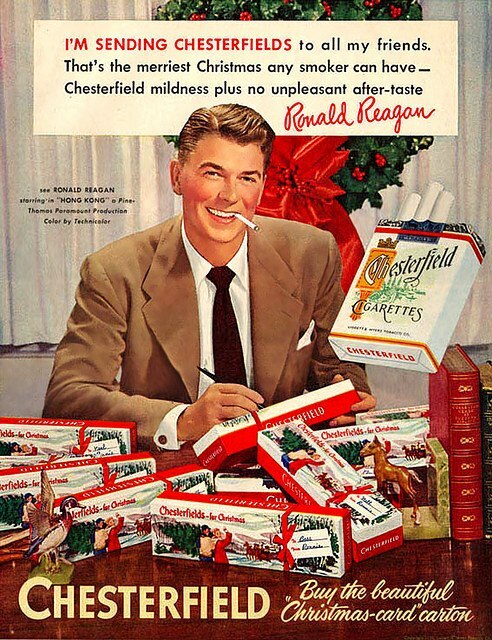 In today's world, Ronald Reagan would have been pilloried for making this ad. 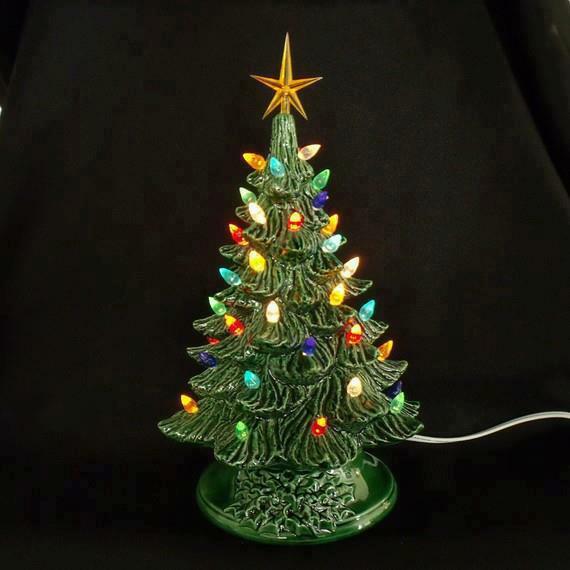 In my younger days, driving around looking at Christmas lights was a tradtition. Now that I'm old and alone, I don't really do it anymore. But I went to see The Hobbit yesterday with my sister. We wanted to see it in IMAX 3D so it was a long drive. Which was great for a recluse like me. Lots of Christmas lights on the way home and my sister was driving so I could really enjoy them. 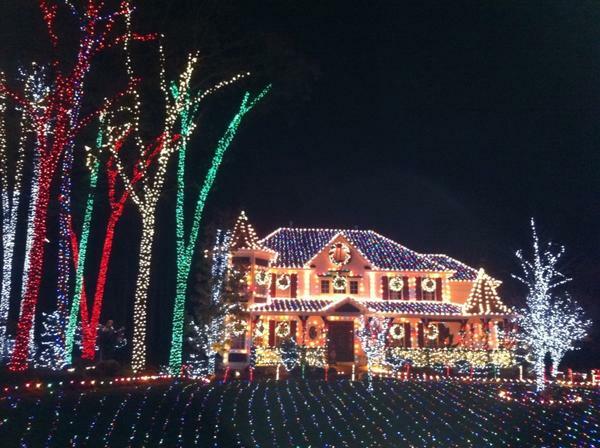 Would never do this myself, but I do love the over the top displays. 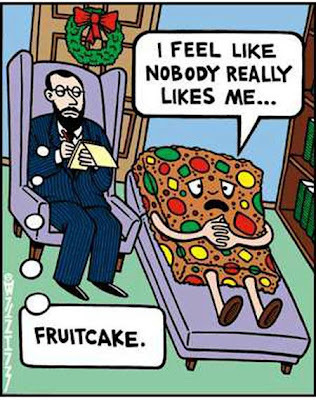 I love Christmas trees but I would bet more holiday fights over Christmas trees have ruined a relationship than anyone has ever counted. To start, there's the tree itself. 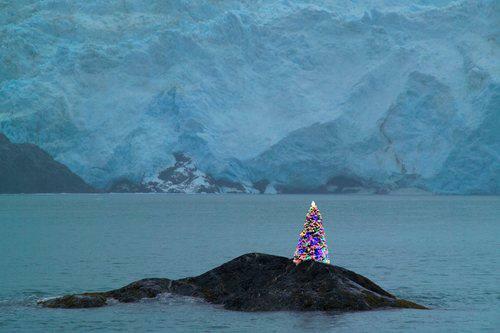 Everyone has their ideal tree. You're either a perfect traditional Balsam fir person or not. Me, I'm not. I've had those but my favorite trees were from the years found a tree for free by bushwhacking into the woods. Especially the white pines. They were sparse, but fit my ornaments perfectly. My theme was always toys. Hence, I've always loved a Charlie Brown tree. 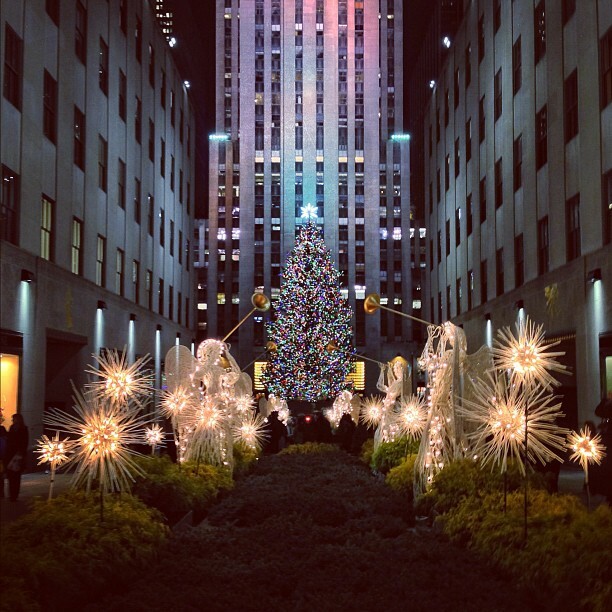 But no matter what the tree preference, then there's the question of appropriate lights. Colored or white? What kind of bulbs? 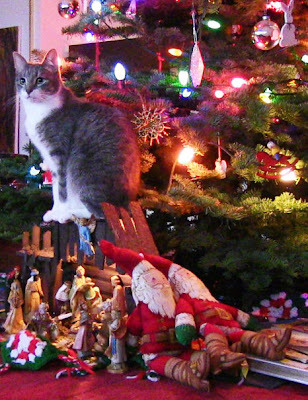 The proper placement of ornaments. 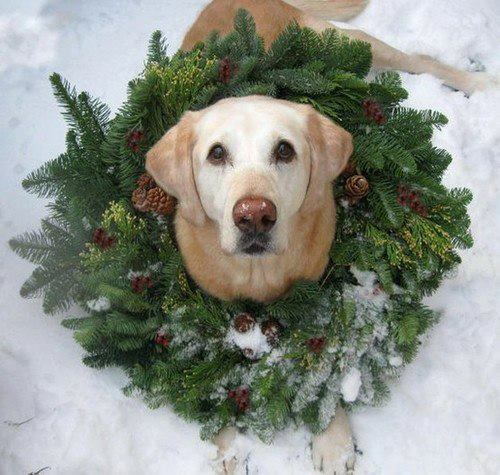 Don't have a cat or a Christmas decorations beyond a wreath on the door this year, but this one reminded me of Christmases past. I think this kitty wants to be the angel on the creche. Something about a red bird on holly in the snow comforts me. Happy birthday Mom. 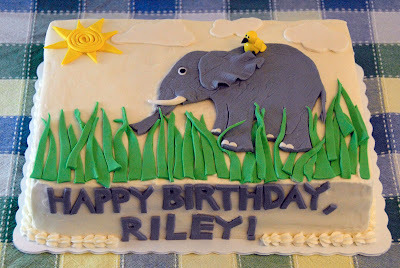 If I knew how to do it, I would have baked this cake for you. Love you both. 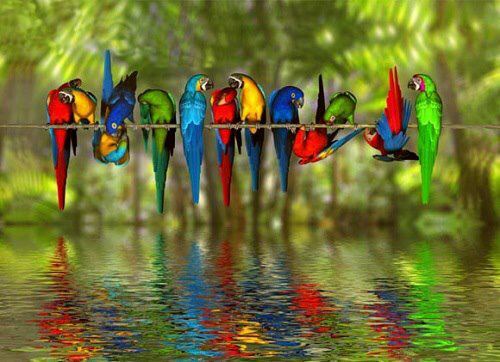 Happy day and many blessings on your way to the next one. 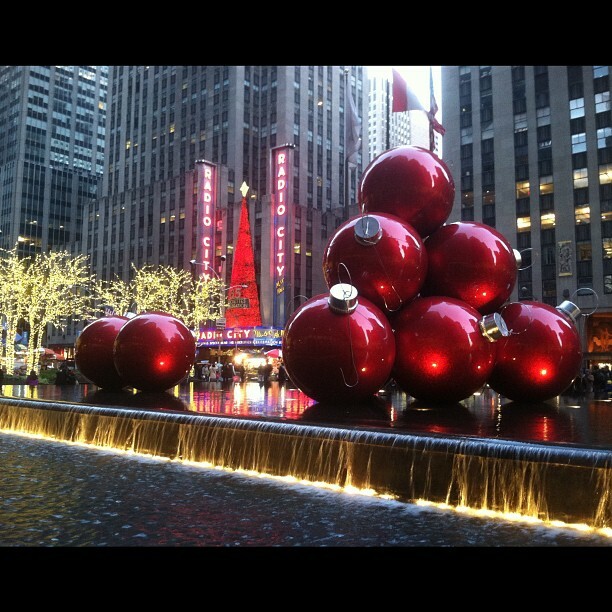 In light of the horror in Newtown, CT yesterday, it doesn't feel quite right to post cheery decorations today. This massacre hit me harder than most. I grew up near there. Been decades since I've been back but I've driven those streets. I have clear memories of that town. One of the biggest events in my life happened in Newtown. 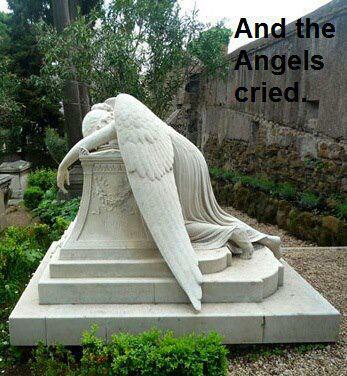 So today all I have is an angel to guide the children ripped from life too soon to the Summerlands. May their families find peace. This guy loves to help. That's why they call them man's best friend. 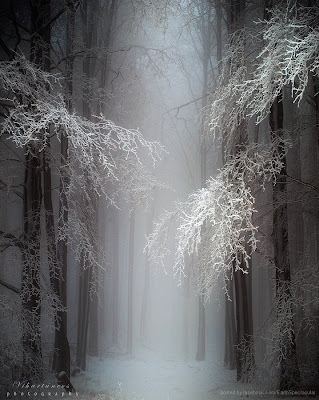 Glad it doesn't look like this in real life where I live, but love looking at photos of enchanted winter forests. 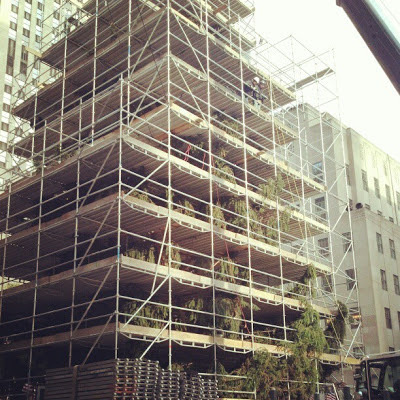 If you ever wondered how they decorate the giant tree in Rockefeller Center (and I have), here's what it looks like when the tree arrives. And a long view of the plaza. There once was a time when a carton of cigarettes was considered a tasteful and thoughtful gift. I remember my Dad getting something like this from co-workers. 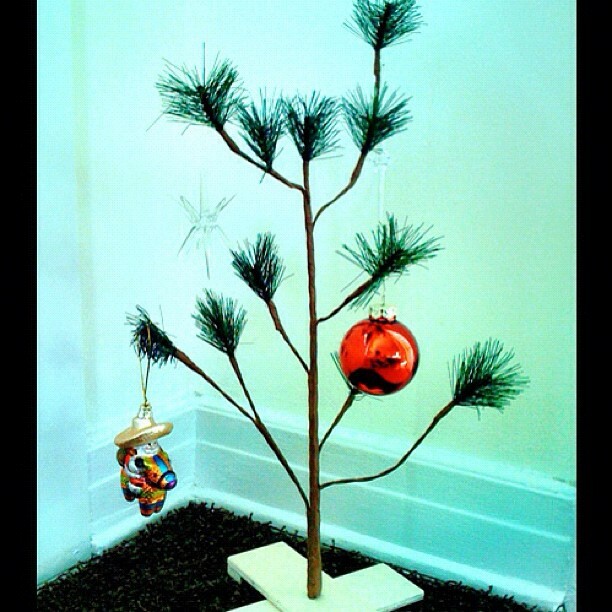 I don't put up a real tree anymore. Haven't done it in years. I have a teeny, tiny fake one I sometimes put on the mantle and I have a string of Christmas lights that I put in a basket and that seems like enough these days. But when my daughter was growing up, I used to go all out. I put up Santas and centerpieces and Christmas villages. Made my own wreaths and swags out of real greens that I spent hours collecting in the woods. 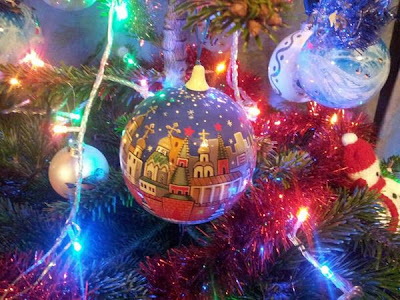 Even when I was a kid, I was more or less in charge of tree decoration. 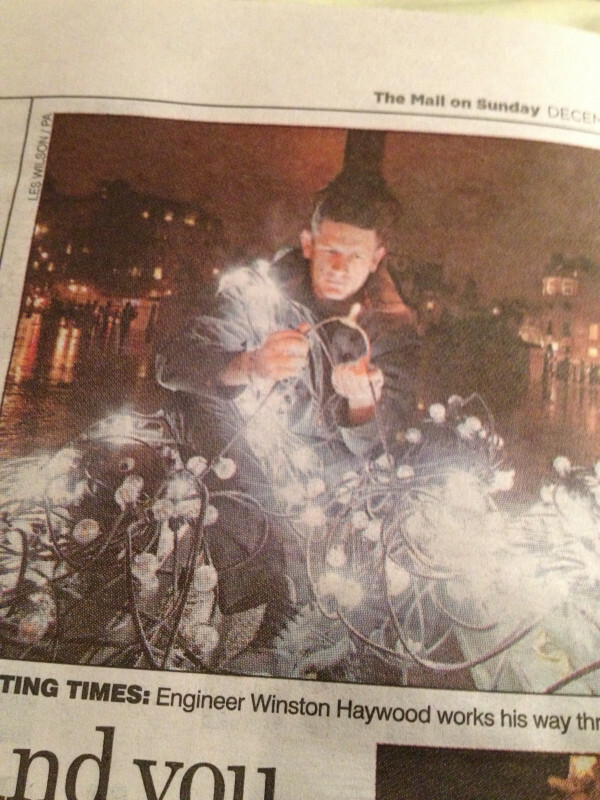 I took over stringing the lights at a rather early age. That was the year my Dad was drunk and literally started throwing barely unrolled strings onto it and calling it a night. 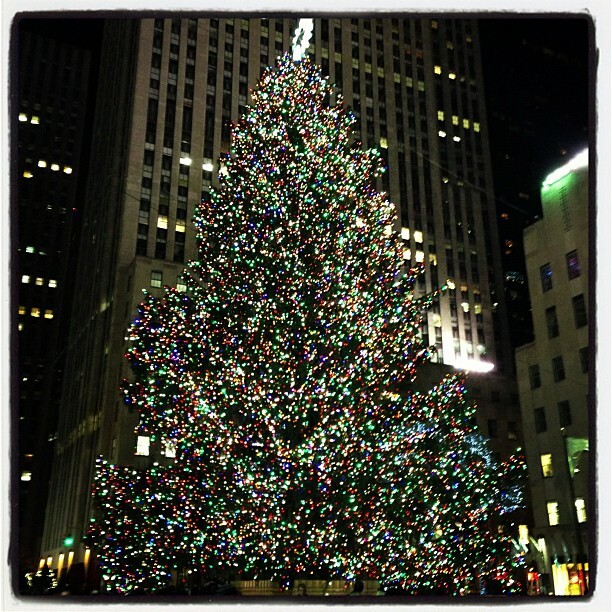 I strung the lights on every Christmas tree I've ever had since then. And of course this meant I was also the one who unraveled the strings and found the bulbs that needed replacing. Back in the day if one bulb was out, the whole damn string wouldn't light. It's a arduous task not well suited to those with small capacity for tedium. So this photo that popped into my social stream from England, just sparked a whole lifetime of memories. 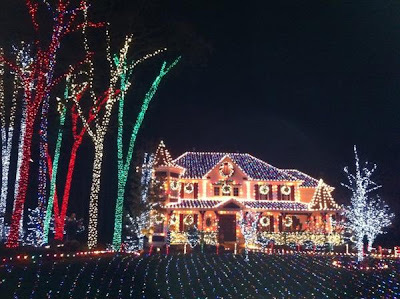 The annual Christmas house tour is going on the in the little city today. The temple across the street is on the tour and judging from the traffic, it's a rousing success. 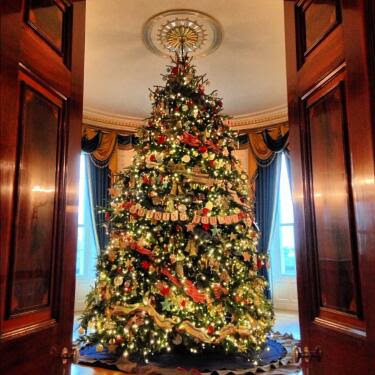 Guessing none of the places are as glam as the White House decorations. I'm told the family White House tree came from North Carolina. Probably from the mountains out yonder. It's a nice one. When I was a kid, nearly every middle class home had at least one of these ceramic trees. As I recall, there was a small white bulb inside the tree and the colored plastic "bulbs fit into holes in the form, so it would light up as if it were a real tree. I vaguely recall amusing myself by rearranging the colors. You could buy them at the bargain store back then for not much money. I suppose nowadays it would cost a small fortune to purchase one that still works. But if I ever got my own place, I would kind of like to have one. I know a lot of naturalists who specialize in oceanography but I've never seen these mosaic sea creatures before. Would make a heckuva Christmas decoration. 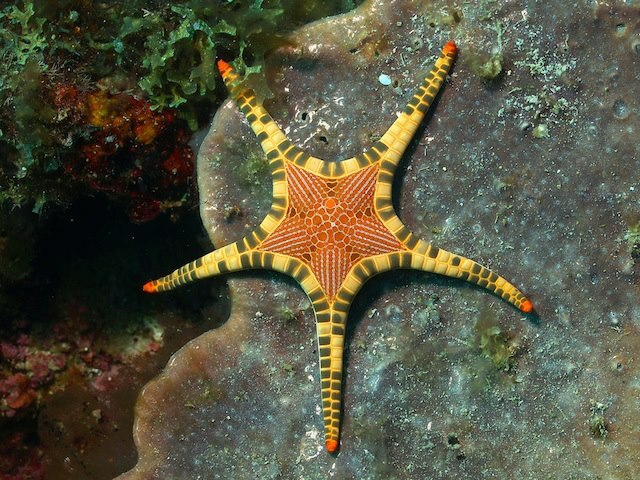 More photos of different sea stars and info about them at the link. But back to the trees, which give the Olympic Peninsula its quiet aura. 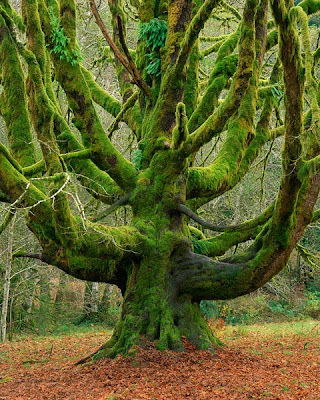 This Bigleaf Maple, an open-grown ancient, represents to me all that I love about trees, with its giant, spreading, moss-and-fern blanketed limbs. The mossy giant has patiently posed for my camera numerous times, and this is my favorite color portrait. I suppose everyone on the internets watches dozens of cute animal videos in any given week. I'm so jaded now, I don't even make it through all of them. Usually the more people that say this is the best, cutest ever means it's really not that special. But this one really is. Good old Bo is a big dog now but still just as cute as a puppy. One of my favorite fairy tales, The Ice Queen, has a scene set in Lapland. Some of the older versions of the story don't make it sound particularly pleasant. But none made clear just how stunning the sky is there. 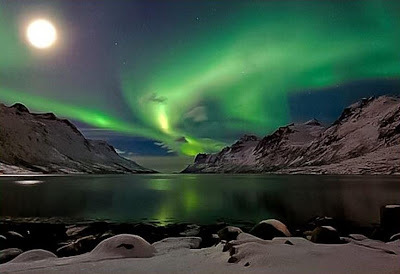 I would be willing to endure some amount of cold to see this in person. 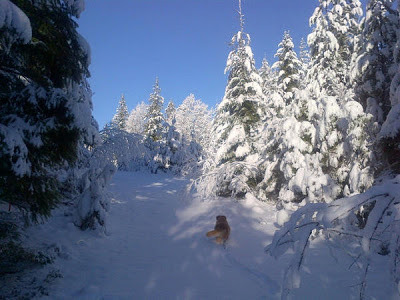 December first already so we'll break the embargo and start posting winter pictures. 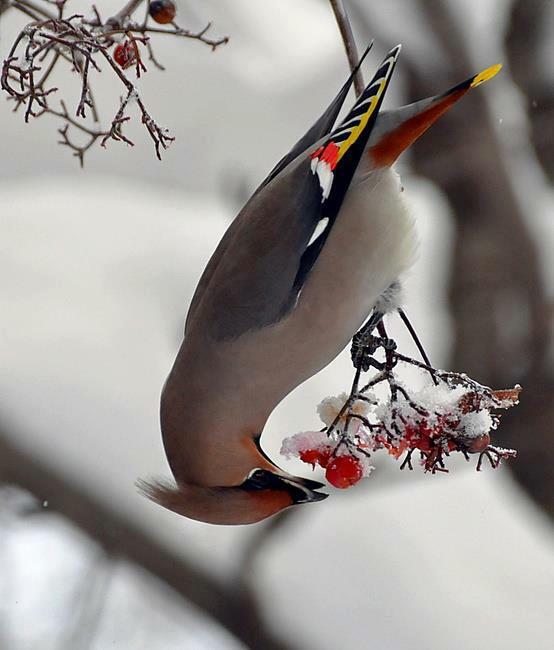 Pretty sure this is a cedar waxwing. I've never seen one in the wild. 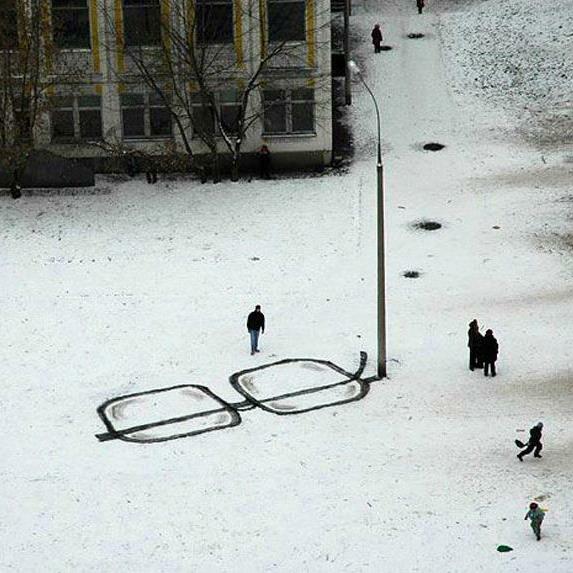 I would like to, but hope I don't have to be standing in a frozen place to do it.